As I sit at my desk and write this to you, the Narcissus ‘Tete-a-tete’ that I have planted on my terrace are now fiercely glowing silhouettes, brightly backlit by the sun that is also shining warmly on my face. The smiling sun is a nice change from the cooler temperatures and gray days and from this late winter flu I have been entertaining these days. Spring is almost here, I can almost smell it hence this cold, but the last day of winter is officially March 19th, so we are just about out of the woods. From the windows, I can see the leaf buds of Platanus x hispanica swelling up and pulling away from the branches, just about ready to open. I haven't been outside much the past few days but besides getting enough rest and drinking plenty of teas I have surrounded myself with multiple vases of these little striking yellow blooms to make myself feel better, a little extra sunshine inside. Who wouldn't smile because of that?! Most everybody loves the Narcissus, for their own reasons, but for many it heralds the triumphant return of spring and an end to the long, cold months of winter. But why else do we love it and what is it about them? Is it the piercing yellow color that demands the attention of our eyes in an otherwise still drab landscape? The color alone, reminiscent of the sun, invokes an uplifting feeling of happiness and cheerfulness. Is it maybe because the rest of bloom parade is not far behind in the marching procession of blossoms known as spring? So while admiring them from my reclined position, the stories and symbolism of Narcissus started playing out in my medicated head…. The Narcissus has been a subject for writers and artists for more than 20 centuries, often-symbolizing rebirth, new beginnings and representing luck and prosperity. 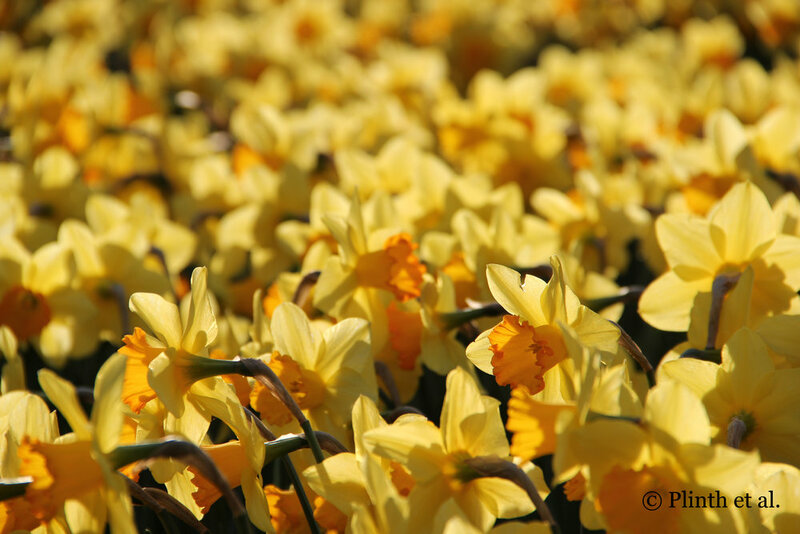 Could that be the reference in the cultivar Narcissus 'Fortune' as seen above? Giving daffodils as a bouquet is said to ensure happiness to the receiver but remember to always present them in a bunch because though the cheerful flower is associated with good fortune it might forebode misfortune if given as a single boom. Could this be why they are sold in florist shops in bunches rather than single blooms as other flowers? Narcissus was a young man of immense beauty who broke the hearts of many lovers along the way, lastly in his mortal life was the wood nymph Echo. Narcissus not paying attention to anyone else and constantly looking at his own reflection in a pool of water, falls in love with himself, thinking of no one else. This is how he spends his time, leaning continuously over the pool and gazing, until he discovered he could not embrace his reflection and soon enough he fell into the water and drowned, with the gods immortalizing him as the narcissus. The story of Narcissus in Greek mythology, is a sad one where the flower symbolizes self-esteem and vanity. Shall the water not remember Ember my hand’s slow gesture, tracing above of its mirror my half-imaginary airy portrait? My only belonging longing; is my beauty, which I take ache away and then return, as love of teasing playfully the one being unbeing. whose gratitude I treasure Is your moves me. I live apart heart from myself, yet cannot not live apart. In the water’s tone, stone? that brilliant silence, a flower Hour, whispers my name with such slight light: moment, it seems filament of air, fare the world becomes cloudswell. well. The meaning and symbolism behind this flower has inspired many writers to artists and will continue to do so for a long time to come. In Kate Greenaway's Language of Flowers – it is listed twice, once by the common name daffodil where it means regard and in its latin form Narcissus we see it listed as egotism. You choose. Salvador Dali, Caravaggio, John William Waterhouse, and Poussin, among countless others have been inspired when putting brush to canvas, using the the subject and the stories behind it as their muse.